Cambrian Series 3 is the still unnamed 3rd Series of the Cambrian. It lasted from about 509 to 497 million years ago and is divided into 3 stages: the unnamed Stage 5, the Drumian, and the Guzhangian. Cambrian Series 3 is preceded by also unnamed Cambrian Series 2 and succeeded by the Furongian series. 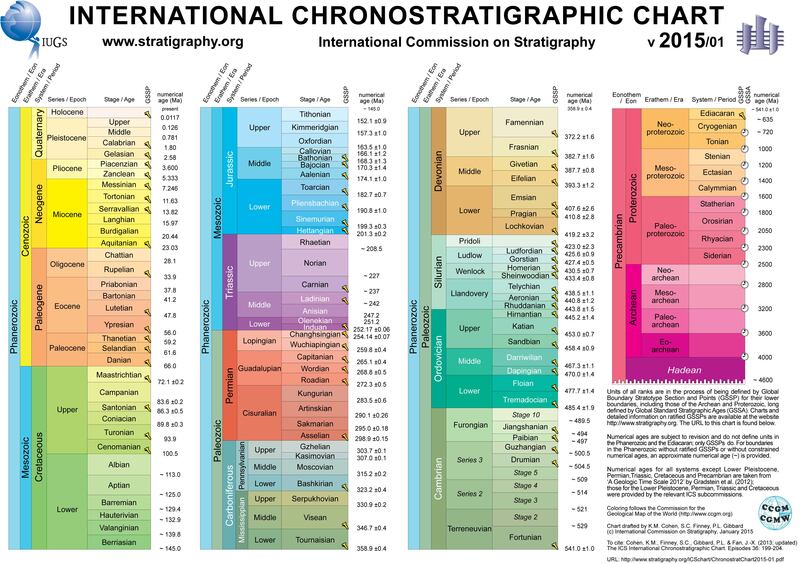 The International Commission on Stratigraphy still has to decide on the official name of the 2nd series of the Cambrian. The new name will also replace the older term "Middle Cambrian". The lower boundary of Series 3 has the same definition as Cambrian Stage 5. This boundary has not been formally defined yet by the ICS but a number of proposals for fossils and type sections have been made. The most promising fossil markers are the respective first appearances of either trilobite species Ovatoryctocara granulata or Oryctocephalus indicus. Either species should have an age close to 509. The Series 3-Furongian boundary has the same definition as the Paibian stage. It is defined as the first appearance of Glyptagnostus reticulatus around 497 million years ago. 1 2 3 4 "GSSP Table - Paleozoic Era". Retrieved 15 November 2012. ↑ Sundberg, F.A. ; Zhao, Y.L. ; Yuan, J.L. ; Lin, J.P. (22 September 2011). "Detailed trilobite biostratigraphy across the proposed GSSP for Stage 5 ("Middle Cambrian" boundary) at the Wuliu-Zengjiayan section, Guizhou, China". Bulletin of Geosciences: 423–464. doi:10.3140/bull.geosci.1211. ↑ Gozalo, Rodolfo; Álvarez, María Eugenia Dies; Vintaned, José Antonio Gámez; Zhuravlev, Andrey Yu. ; Bauluz, Blanca; Subías, Ignacio; Chirivella Martorell, Juan B.; Mayoral, Eduardo; Gursky, Hans-Jürgen; Andrés, José Antonio; Liñán, Eladio (1 December 2011). "Proposal of a reference section and point for the Cambrian Series 2-3 boundary in the Mediterranean subprovince in Murero (NE Spain) and its intercontinental correlation". Geological Journal: n/a–n/a. doi:10.1002/gj.1330.